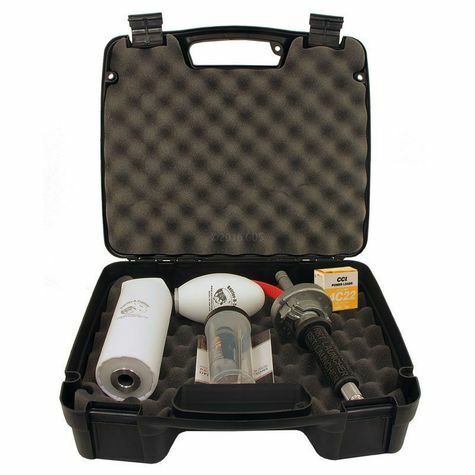 The RRT kit combines the original handheld dummy launcher with everything you need to get started, including 100 light loads, a cleaning kit, and a handy case to carry it all around with you. The Retriev-R-Trainer comes in a deluxe kit. The deluxe kits include the handheld launcher, 100 of the light power loads, a PVC plastic dummy, a canvas dummy with a red streamer, a pistol cleaning kit that's going to cover everything that you need to keep your Retriev-R-Trainer in good shape, plus a hard-shell carrying case. There's several different styles of dummies for the Retriev-R-Trainer. This is showing just two of them. This is your canvas dummy but it has a tail that comes with it. So, as it's coming down you are going to get some movement. It's going to help the dog with marking. Then we've got the PVC dummies. We prefer these for water work. It's a little bit smaller and it's a plastic dummy. Red is similar to orange in that it's difficult for a dog to see. So you want to keep that in mind. These come in all sorts of different colors, all sorts of different styles. So if you are looking for some variation we've got it. 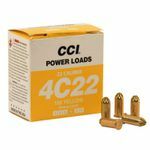 "Love this product, helped our Lab get over his gun shyness. He is a retrieving fool now." Love this product, helped our Lab get over his gun shyness. He is a retrieving fool now. Thanks. "My pup is in love with retrieving, and it helps her perfect her tracking in the air." I really like this product. It can launch dummies super far. My pup is in love with retrieving, and it helps her perfect her tracking in the air. I recommend wearing a thick leather glove the impact hurt my hand without. "My dogs love this thing... Until I break down and buy a remote launcher, this is the ticket." My dogs love this thing and not having to, or being able to throw a bumper as far as this will makes it worth it. I have several acres behind my house, and if I don't use the green loads, the dummies go a bit too far, but in an open area they are all great. Until I break down and buy a remote launcher, this is the ticket. "Just bringing it out gets the dog fired up." Launcher works awesome. Just bringing it out gets the dog fired up. Easy to use, easy to clean. If you are in the market for a launcher, this is a good one. "Great product. 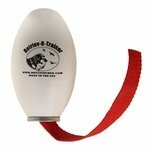 Exactly what we expected, and a great training aid for the dogs!" Great product. Exactly what we expected, and a great training aid for the dogs! "This is a great way to introduce a gunshot to any young pup." Works really well. Shoots the dummy out much farther than I expected. This is a great way to introduce a gunshot to any young pup. Great service. Thank you. "Significantly improved the distances I can work my dog"
This dummy launcher works as advertised and throws the dummies plenty far enough for dog training. It has significantly improved the distances I can work my dog, since it throws the dummies farther than I can. I would definitely suggest the user wear hearing protection. Even though this uses .22 blanks, it is considerably louder than the bark of a typical .22 rifle. "It does everything I need and then some." It does everything I need and then some. "He couldn't wait to try it and used almost the whole pack of "bullets" that it comes with." I bought this for my husband for Father's Day because I overheard him talking about wanting one. I kept my fingers crossed that this is what he was talking about. It was. He couldn't wait to try it and used almost the whole pack of "bullets" that it comes with. He and Raven, his best friend, black lab, could have stayed out there for hours. He should have worn earplugs before trying it (solely his fault), but other than that he said this was the best present ever. Now, I have to go reorder some "bullets" because if I let him on this site, we'll be broke! 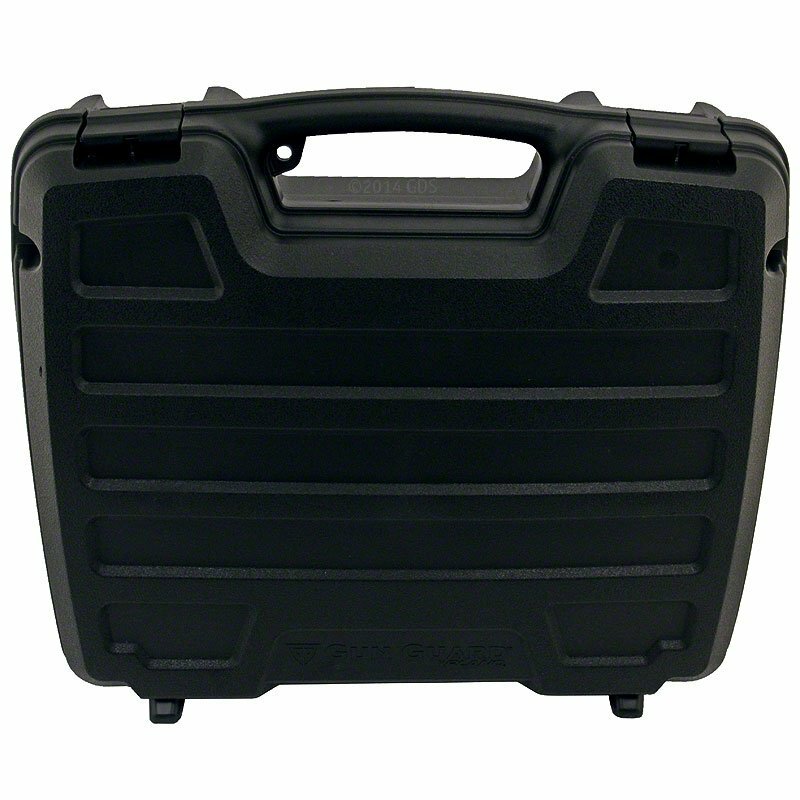 "Everything you need in a nice case." My dog can't quite follow the dummy yet. This thing launches great. I was really surprised at the power it has. He is getting the hang of it. I'm very satisfied with the kit. Everything you need in a nice case. I would recommend it to anyone. "Training alone most of the time this really helps"
"Works excellent for a hunting retriever." Works excellent for a hunting retriever. "Our dog is nuts about this product." Our dog is nuts about this product. Best gift anyone in our family received. So very fun! "I got this for my father in law for Christmas, and this thing is awesome!" I got this for my father in law for Christmas, and this thing is awesome! He just lit up when that thing shot for the first time! The dog loves it and it's a great way to wear him out! "Works great. Both dogs love it." Works great. Both dogs love it. Also my lab was gun shy before I got the thrower, and after a week playing with her she's a totally different dog. "Giving it to my grandson for his birthday"
Giving it to my grandson for his birthday on Saturday. Everything works great. Shoots much farther than I anticipated. "Perfect for training my lab." Perfect for training my lab. The launcher throws the dummies out far enough to challenge marking and give a realistic hunting experience. My pup is learning to use his eyes first and nose to locate. It's like having a training partner with you anytime. "Lots of fun. Great service, and quick delivery." Lots of fun. Great service, and quick delivery. It is everything advertised. A great training tool. Great product. Great price. Very happy!! "Thoroughly impressed with how much my dog loves this launcher." Thoroughly impressed with how much my dog loves this launcher. Anytime I pull it out for him, he goes wild. I've only shot about six or eight rounds through it but so far it's perfect. The launcher is the first one I bought. It is easy to use, and my puppy really likes it. Keeps her on her toes. It is a bit louder than I thought. The kit is great. Has everything you need to get started. Very easy to use and no kick. Zeke loves the dummy launcher, both on the lake and in the field. A great product! Springer Spaniels and Small Munsterlander. Hunts. "Love it and the new dummies with the black and white tails. My dog sperry loves them as well." I purchased this training gun, because my older one that I have used for years (I purchased it in early 1975), the cartridges after shooting it were hard to extract. I used a pair of pliers to pull the cartridge after the extractor would lift it part way out. My new gun works beautifully. Love it and the new dummies with the black and white tails. My dog sperry loves them as well. Very happy with this product. The service was fast. "Works great. Dog loves it." "Quality built, and does what it is advertised to do." Quality built, and does what it is advertised to do. "A great aid in conditioning a gun shy dog." Great training aid, the dogs love it- would like a shoulder attachment to go with! A great aid in conditioning a gun shy dog. "Has worked reliably for several years, now. I use it all the time." Has worked reliably for several years, now. I use it all the time. "If you got someone to train with you can't beat these style of launchers." This is the only launcher I own (until I can afford one of the remote ones). It does not include the extractor tool, but it is not needed. When Opening it up (breaks down like a over/under shotgun) you can pull down on it and it will flex the spent blank out if repeated twice and held on the second time. If you got someone to train with you can't beat these style of launchers. Happy hunting, Aaron. "Helped me keep my dog conditioned during the off season for waterfowl and upland game birds." This launcher performed flawlessly during the winter and on the water. It has helped me keep my dog conditioned during the off season for waterfowl and upland game birds. I would recommend this product to anyone that has a dog that retrieves or is training to retrieve. "The launcher has been great, my dog loves it! He knows where it's kept in the truck and recognizes the case! " The launcher has been great, my dog loves it! He knows where it's kept in the truck and recognizes the case! Gun Dog Supply is a great company and we've been able to easily reorder blanks and dummies to continue to use every year. Have never had a problem with the actual launcher. Love the launcher. The only problem is that the load on the blanks shoots the dummy much further than I prefer. Other than that it's a great training tool. "My dog loves the dummy launcher." My dog loves the dummy launcher. The pop of the blank adds to the excitement and so does the distance and speed the the dummy is launched. The only down side is your hand will take a beating from the kickback so wear a thick glove, cold weather glove. My dog loves this thing. She has been gun shy but is getting over it. Launcher works great but dummies take a beating. Plastic dummy came apart after only a few launches. "The moderate-power cartridges that came with it are too powerful." The moderate-power cartridges that came with it are too powerful. They throw the dummy about 70-80 yards, when half that would do. The spent cartridges are a little difficult to eject. Need to flip the lever several times to get them out enough to grab and pull hard. Other than that, the unit works fine. 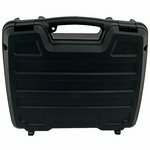 "durable design, easy to operate, nice storage case"
LIKE: simple device, each to eject spent brass, durable design, easy to operate, nice storage case. "Case hard to shut. Cleaning kit should include a oil rag in it." Case hard to shut. Cleaning kit should include a oil rag in it. "Wish it had a long handle so dogs could learn to track"
Wish it had a long handle so dogs could learn to track "gun"
I now have 2 launchers, a shoulder stock, 2 remote launcher stands and a bucket of dummys. I use them every time I train. Pros: Good quality Good choice for retiever training alone. Allows for training at distances that can not be hand thrown. Allows for both falling bird and shot simulation in one item. Shoulder stock is great addition and the remote stand accessory is good for simulated testing. Cons: Even with light loads this can be a "handful" when firing hand held. Use gloves. I would defintely recommend at least the stock accessory for repeated use in training sessions. The seal freezes and doesn't work well, if below 20 degrees or so. "Unit works fine but hard to eject spent blanks. Bumper blew apart in short order - replaced by manufacturer. Insulation keeps falling out, had to glue to case." Unit works fine but hard to eject spent blanks. Bumper blew apart in short order - replaced by manufacturer. Insulation keeps falling out, had to glue to case. "THE KIT DOES NOT COME WITH THE EXTRACTING TOOL. IN ADDITION, THE BLANKS CAN BE VERY DIFFICULT TO REMOVE." THE KIT DOES NOT COME WITH THE EXTRACTING TOOL. IN ADDITION, THE BLANKS CAN BE VERY DIFFICULT TO REMOVE. I purchased one of these units many years ago, and it was perfect. This unit seems cheaply made. Plus the yellow loads are too much. I'm not hunting on the moon you know. The unit should be shipped with the green rounds. This was a total piece of junk. The dummies fell apart almost immediately, and the cartridges were difficult to remove. I have since bought a different system and have had no problems. I would not reccomend this product. Our Best-Selling RRT Combo. Get your retriever excited about training. Restricted Shipping. In the United States ships FedEx Ground only. Express not available. Can only be shipped with NO LOADS to addresses outside the US48. Includes the Retriev-R-Trainer dummy launcher, a white RRT Canvas Dummy, a white Plastic Dummy with red tail, RRT cleaning kit, 100 rounds of medium power charges / dummy loads and RRT instructions -- all in a custom fitted carrying case. Recommended. 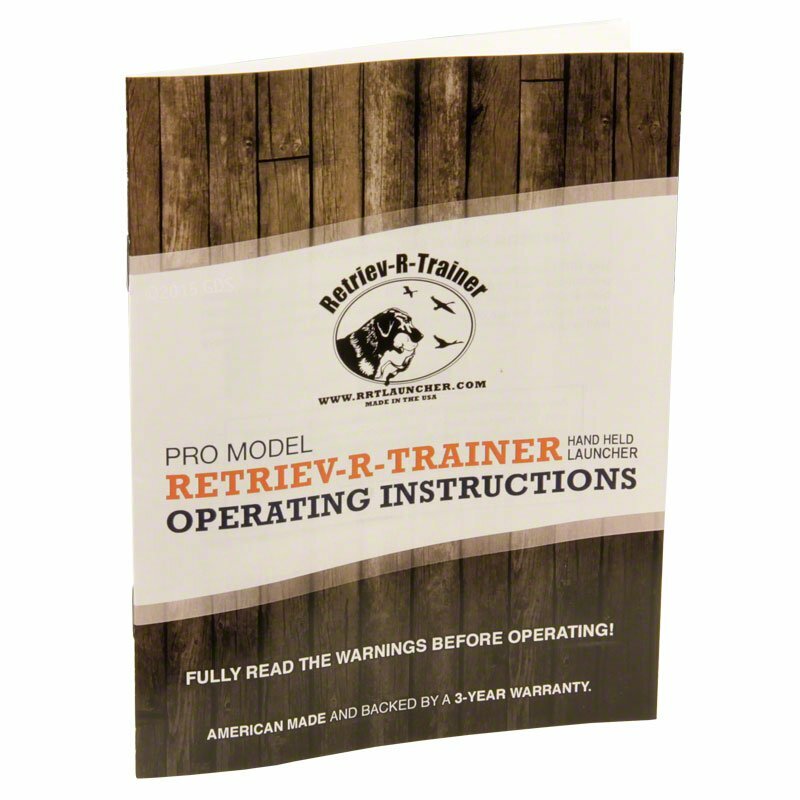 The Retriev-R-Trainer should only be used with dogs which have already been satisfactorily conditioned to gunfire. The use of "heavy" loads will shorten the useful life of the dummies. 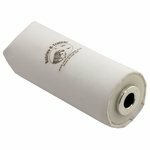 To prevent molding or premature deterioration, dry the canvas dummy thoroughly following retrieves in water. Increased distance can be obtained by using the plastic dummy and by varying the angle of fire. For safety purposes, we recommend that you handle the Retriev-R-Trainer as you would a firearm. 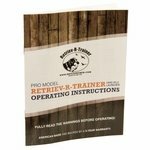 The Retriev-R-Trainer is a practical aid for training retrievers. Training dummies designed for the use with it can be power thrown two to three times farther than hand-thrown dummies. They are useful on land or water. Extra dummies can be used to throw doubles, triples, etc. The Retriev-R-Trainer uses blank power charges for throwing power. The accompanying report eliminates the need for a blank pistol. User must thoroughly clean the barrel, chamber, and hinge areas with a good gun cleaning solvent after each use. Failure to properly maintain the RRT Launcher may result in serious injury or death. You may purchase the RRT Cleaning Kit to simplify this process. A small amount of gun oil applied to the hinge area after cleaning will help to ensure smooth operation. 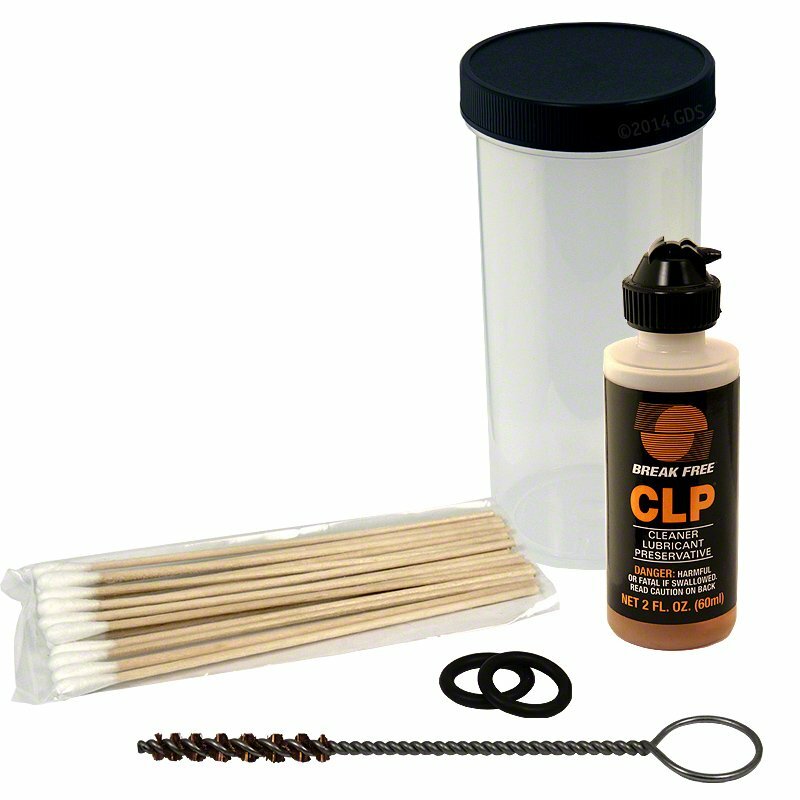 Cleaning of the chamber can be enhanced by using a .22 caliber wire brush. Also, thoroughly clean and dry the inside of the dummy tube after each launch to be certain that, prior to each time you launch the dummy from your launcher, it is free of debris both internally and externally. 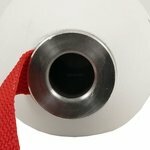 Failure to properly maintain the aluminum insert tube in your dummy may result in serious injury or death. A rubber "O" Ring in a grove near the outer end of the barrel provides a seal for the release gases of the power charge. This "O" Ring will wear causing some of the gases to escape, thereby reducing the flight distance of the dummy. Apply a thin coat of Vaseline, or any other lubricant safe for use on rubber components, to prevent drying and cracking of the o-ring. Replacement "O" Rings are available separately. Place an RRT training dummy over the barrel and slide it down. The distance of the throw can be controlled by how far the dummy is placed down the barrel -- all the way for maximum distance, less for shorter throws. Open the breech by pressing the thumb release/latch located in the middle of the launcher just above the hand grip. The launcher will now pivot open exposing the open chamber for receiving the blank power charge. Fully seat the charge in the chamber as you would a single shot rifle or shotgun. Close the unit and press the thumb latch to insure that it is fully closed. Firmly grasp the launcher handle in one hand with the thumb latch oriented toward the shoulder of the holding arm. The heel of the holding hand should be facing the thumb latch and your fingers should be wrapped firmly around the grip. Your thumb will be closest to the Pull Knob. Bend the elbow slightly and position the launcher about waist high and one foot from your body. Aim about 45° from the horizontal off to your side toward the target area. Pull the firing knob back to its fully extended position and release it to launch. NOTE: NEVER DRY FIRE your Retriev-R-Trainer! 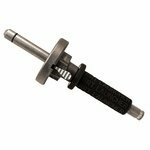 Your RRT Launcher is not a firearm, but the same handling, care, and safety precautions must be exercised. Your Retriev-R-Trainer is provided with certain built-in safety features, but these are not substitutes for safe handling practices, which include the use of ear and eye protection as well as the use of heavy leather gloves. Firing the dummy is equivalent to firing a six- to eight-ounce bullet. A heavy recoil and loud report should be expected, especially when using red power loads. ALWAYS use eye and ear protection and wear heavy leather gloves when firing. Expect a loud report when the launcher is fired. Prolonged exposure to loud report may affect hearing to dogs and surrounding persons. Never attempt to load your Retriev-R-Trainer with bullets or charges other than those recommended. Always remove the training dummy from the barrel of the launcher before storage. Before loading or firing, ALWAYS make sure the barrel and the metal insert in the dummy are free of obstructions. The Retriev-R-Trainer is NOT A TOY! Do not allow children to play with or operate the unit. NEVER POINT OR FIRE The Retriev-R-Trainer AT A PERSON OR ANIMAL!